1000k+ later and I can still say I am very impressed with the R-016 Super Light. The R-016 has made it really easy to forget my old FM066SL. The R-016 has continued to be really smooth and handles the road noise and debris very well. I tested this frame built up with SRAM Force and the VeloBuild 50mm clinchers wrapped with Michelin Pro 4s. I’ve ridden the R-016 hard in preparation for this race season over all kinds of terrain which included smooth and rough roubiax style roads. There were also many climbs with both steep and long flowing descents and I can say it handled them both superbly. I dared to take it up to around 45mph and never noticed any speed wobble or anything unexpected. It felt solid and smooth wanting to gain more speed. When taking my FM066 up the that speed I definitely felt more uneasy due to the fragility of the frame, on this one I had confidence because of the stable feeling. Climbing up those hills is where the R-016 really excels. The frame never flexed any that my little legs could notice. The rear triangle feels really stiff and after intentionally adjusting the brakes really close to the rim to check for rub under pressure, it avoided any noticeable amount. I felt like Contador dancing on the pedals up the climbs on this frame. It’s a joy to take uphill. Whether in the saddle or getting out of it to sprint and attack the frame held up well. There was one question in the forum about the front derailleur alignment, however it seemed to be aligned on this frame. We haven’t had another order with the problem at VeloBuild. I haven’t noticed any troubled shifts with this frame. Others in the forum have mentioned toe overlap due to a shorter wheelbase. I have noticed this but also had it on my last frame (066). For my riding it doesn’t really come into play other than turning around in the street at which time I’m not usually pedaling. Overall I’m still really happy with the R-016 and would highly recommend it to anyone looking for a super light climbing build. In comparison to the FM066SL going down the other side of the climbs, the R-016 frame was much more stable and confident descending. I’m looking forward to many more miles and floating climbs. Justin is a 29 year old Physician’s Assistant with a sports medicine group. When not in surgery, he rides as many times a week as possible for a husband and busy professional on call at all hours.He races with Team Biker’s Choice in the tall hills north of Nashville. 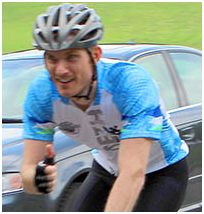 He is a very lean 6’2″ tall…think Andy Schleck. Justin is a climbing machine…a nice bloke and all around good guy.